After the success of the Surface Pro series, Microsoft have developed their first ever laptop, the Surface Book. When I received the email from Microsoft asking me to review a Surface Book, the excitement was a bit like the one of a child on Christmas eve! Since the Surface Book was released I had been eager to get my hands on one. When agreeing to trial a Surface Book I was given the opportunity to trial one for 4 weeks; this would give me the chance to extensively test the Surface Book and see if it really was the ultimate device. This device can become every artist’s dream, a designer’s fantasy, a musician’s melody. On first impressions, I could see the Surface Book did continue the sleek design that the Surface series has, meaning the device looks like a creation from NASA with the smooth magnesium casing and it’s futuristic fulcrum hinge. I had previously read some mixed reviews about the fulcrum hinge as when the Surface Book is closed the screen doesn’t sit flush with the base. For me this adds to the style that the Surface Book has, no dust or dirt was found inside the device and the smoothness of the motion when you open or close the Surface Book is something quite pleasurable. Due to the fulcrum hinge you are able to sit the with the screen tilted right back and the device is well supported. The Surface Book has a 13.5 inch 3,000 x 2,000 pixel sense display, producing an amazing 4K picture. The Surface Book is a high end device so does come with a higher price tag compared to the Surface Pro. But once you use the Surface book you realise why. It’s packed with an Intel i7 6600U processor, 8GB of RAM memory and a 256 GB SSD, this thing really flies! 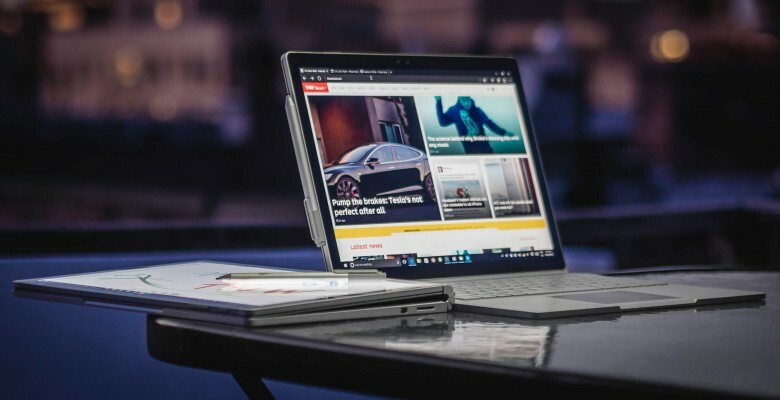 Along with this, the Surface Book has a 1GB NVIDIA GeForce discrete graphics card, which makes this device perfect for graphic design and running high spec applications. The device also includes not one, but two batteries. One battery is in the tablet clipboard part of the device and the other is situated in the base. Under testing I was able to have the Surface Book running for a whopping 16 hours. The Surface Book runs the likes of Minecraft or Photoshop flawlessly. Within Minecraft I was able to push the settings up to the highest quality and it ran just as smooth as it did on the recommended settings. I could edit photos while browsing the internet and listening to music without worrying about facing performance issues. If you team this device up with Office 365 and OneNote then you’ll have everything you need at your finger tips. Even though the Surface Book is Microsoft’s first ever laptop, this device doubles up as a 13 inch tablet as it has full touch capability and includes the Surface Pen. With a press of a button the screen snaps off and you are able to use the Surface Book in it’s clipboard format. Snap the screen back on and you get the use of a full graphics card and dual battery to give you that top performance. This entry was posted in Banner, Reviews. Bookmark the permalink.